Garbanzo with Xacuti Masala served with Dry Italian Herb Pulao Rice. 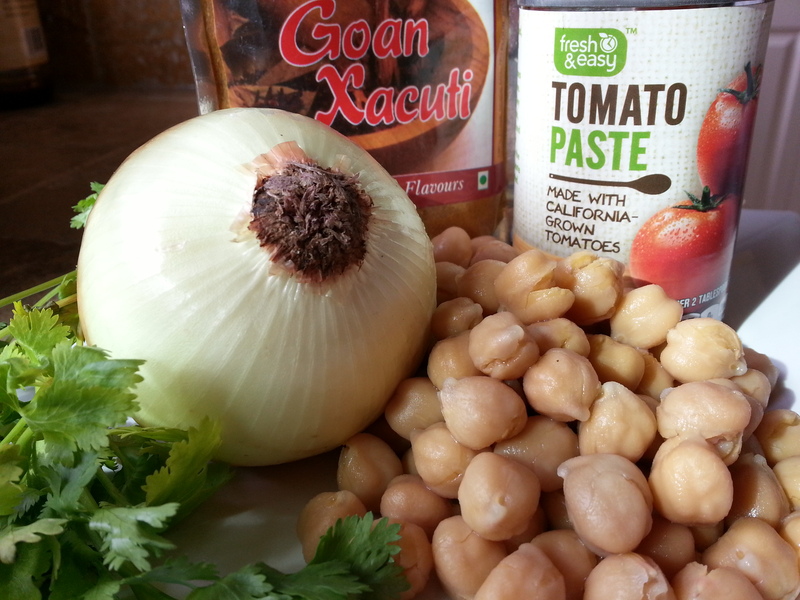 Garbanzo with Xacuti Masala or dry channa masala is a great recipe for a quick vegetarian fix. I like to use the canned beans as its much faster to cook the dish. In Goa these are soaked overnight and boiled either in a pressure cooker for faster cooking or boiled for more than an hour. Garbanzo beans or chana (chickpeas) as they are known in India are cooked in many different savory dishes. Depending on each state in India the recipes vary and these beans are used a lot. The flour of garbanzo beans is called gram flour or besan and is used in batters and for making sweets. The great thing about garbanzo beans is that it is high in protein. The Xacuti Masala used in this dish is made of ground spices of turmeric, cumin, coriander seeds, nutmeg, green cardamom, pepper, sun-dried chillies, cinnamon and aniseed. 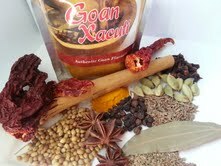 I like to say that the Xacuti Masala is the garam masala of Goa. Ingredients for Xacuti spice mix. Heat oil add the chopped onions saute till light brown, add the xacuti masala and saute for 1 or 2 minutes. Then add the tomato paste, saute till mixed well add the water, cover and bring it to simmer. Then add the garbanzo, sugar and salt to taste. Cooked covered for 15 minutes check occasionally so it does not stick. I like cooking in a non-stick as it does not stick to the bottom as much. Finally add chopped cilantro. 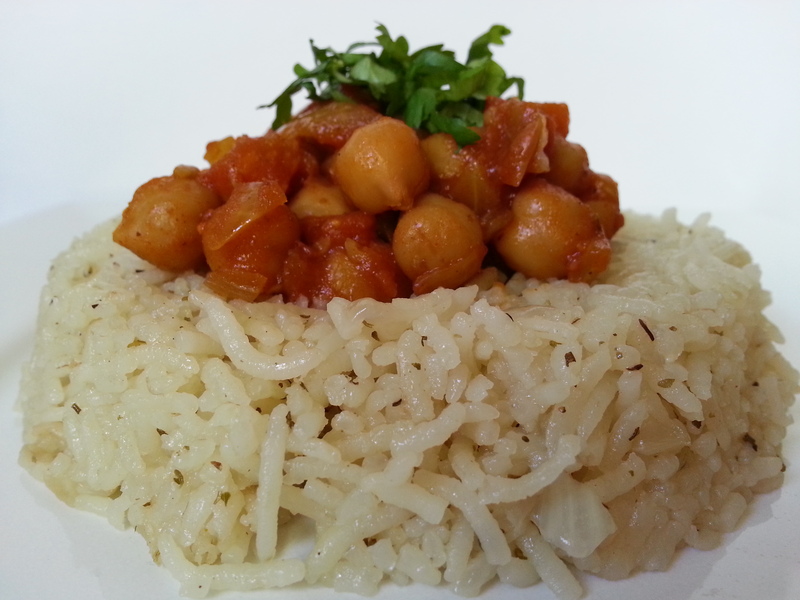 Enjoy this dish of Garbanzo with Xacuti Masala with Pulao Rice, bread or naan. Garbanzo with Xacuti Masala served with Italian Herb Pulao Rice. The Pulao Rice was easy to make. sautéed onions, dry Italian herbs, Knorr chicken flavor bouillon and basmati rice. The house was filled with the smell of the rice cooking and it was divine.